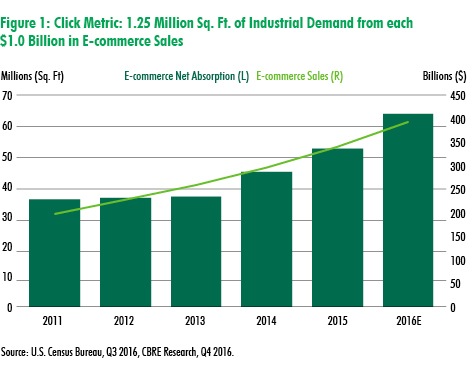 U.S. MarketFlash | Click metric: e-commerce sales per real estate sq. ft. The volume of goods sold online has increased significantly during the current technology boom. This is transforming logistics networks across the country, creating immense demand for warehouse space to satisfy increased consumption. CBRE Research estimates the amount of logistics space needed to accommodate rising e-commerce sales is 1.25 million sq. ft per $1 billion of online sales. This metric was determined by analyzing e-commerce demand as it relates to warehouse space absorption and the amount of logistics space occupied by e-commerce firms relative to their sales.